IN YOUR possession is a motor vehicle that has been thoroughly tested and inspected. Like any other piece of machinery, to maintain it in first class condition, you should lubricate it at the time prescribed with the proper grade of oil and grease and keep all working parts and oil holes clean and free of dirt and grit. You should also periodically have it systematically inspected at an Authorized Willys-Overland Service Station. In the following pages we have set forth the knowledge every owner should have of his vehicle, that he may know to take the best care of it and handle it in such a way that he will get maximum service. Information is also available covering external adjustments and minor emergency repairs. Read and follow these instructions carefully; we are sure that you will then enjoy the satisfactory operation that you rightfully anticipate. Should adjustment or repair seem necessary beyond your ability, don't experiment; have the work done by a competent repair man. It will always prove best and cheapest in the end to have the work done by the Dealer from whom you purchased your car. Many Willys-Overland Dealers have factory trained mechanics and all are familiar with the construction and adjustments through the cooperation of the manufacturer. Do not attempt any adjustments as long as the vehicle is operating satisfactorily. Be sure to obtain the Owner Service Policy, provided by your Dealer on delivery of your new vehicle. Imitation parts are usually of inferior quality and can do serious damage to other mechanical parts of your vehicle. Genuine parts are sold by all authorized Willys-Overland Dealers. Be sure non other than genuine parts are placed in your vehicle. Presence of parts other than those furnished by Willys-Overland will void the manufacturer's Warranty. NOTE: Parts replaced under the terms of the Warranty must be left with the Willys-Overland Dealer who makes the replacement, if full credit is expected. This is important for Owners to know, when traveling outside the territory in which their vehicle was originally purchased, particularly when credit for old parts cannot be established to the satisfaction of the Dealer. In this connection, a forwarding address should be given by the Owner in order to insure the credit reaching him. "This is to certify that we, WILLYS-OVERLAND MOTORS, INC., TOLEDO, OHIO, U.S.A. warrant each new motor vehicle manufactured by us, to be free from defects in material and workmanship under normal use and service, our obligations under this Warranty being limited to making good at our factory any part or parts thereof, including all equipment or trade accessories (except tires) supplied by the Car Manufacturer, which shall, within ninety (90) days after making delivery of such vehicle to the original purchaser or before such vehicle has been driven 4000 miles, whichever event shall first occur, be returned to us with transportation charges prepaid, and which our examination shall disclose to our satisfaction to have been thus defective; this warranty being expressly in lieu of all other warranties expressed or implied and of all other obligations or liabilities on our part, and we neither assume nor authorize any other person to assume for us any other liability in connection with the sale of our vehicles. 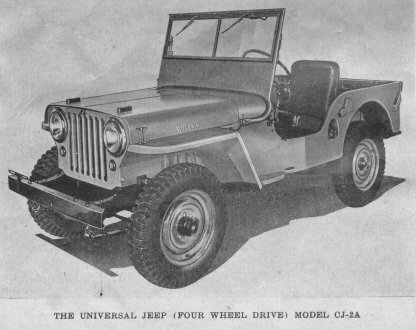 This warranty shall not apply to any vehicle which shall have been repaired or altered outside of an Authorized Willys-Overland Service Station in any way so as, in the judgment of the Manufacturer, to affect its stability or reliability, nor which has been subject to misuse, negligence or accident"
The Manufacturer makes no warranty against, nor assumes any liability for any defect in metal or other material in any part, device or trade accessory which cannot be discovered by ordinary factory inspection. NOTE -- Willys-Overland Motors, Inc., reserves the right at any time or times to revise, modify, discontinue or change any models of its vehicles, or any part or parts thereof, without notice; and, without it or the Seller, incurring any liability or obligation to the Purchaser.